This year, when spring has been so slow to come for so many of us, it’s hard to fathom the fact that the end of the school year is just around the corner! And that means Sunday School classes will be going into summer recess for many children before long, too. 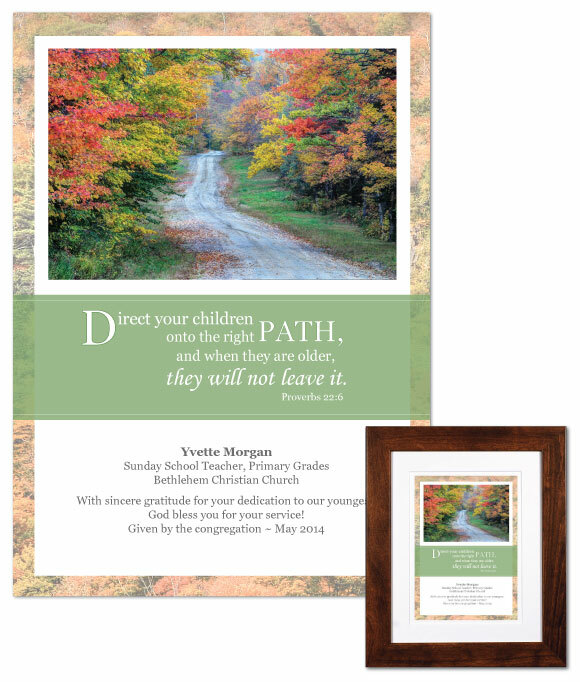 We’re busy filling orders for teacher appreciation plaques, as many are taking the opportunity to convey thanks to Sunday School teachers, parochial school teachers, and others who work with the young people of churches and schools. If your child will soon be saying farewell to a favorite teacher, our personalized teacher appreciation plaques are wonderful mementos. Choose framed or unframed. Either way, we use the same premium museum-quality materials to create our artwork. These will look just as good years from now as the day you present them to the recipient! View all the designs here.